By ELLIOTT MINOR ALBANY, Ga. May 18, 2006 (AP)— A stand of American chestnut trees that somehow escaped a blight that killed off nearly all their kind in the early 1900s has been discovered along a hiking trail not far from President Franklin D. Roosevelt’s Little White House at Warm Springs. The find has stirred excitement among those working to restore the American chestnut, and raised hopes that scientists might be able to use the pollen to breed hardier chestnut trees. Experts say it could be that the chestnuts have less competition from other trees along the dry, rocky ridge. The fungus that causes the blight thrives in a moist environment. The largest of the half-dozen or so trees is about 40 feet tall and 20 to 30 years old, and is believed to be the southernmost American chestnut discovered so far that is capable of flowering and producing nuts. The rugged area known as Pine Mountain is at the southern end of the Appalachians near Warm Springs, where Roosevelt built a home and sought treatment after he was stricken with polio in 1921. “FDR may have roasted some chestnuts on his fire for Christmas or enjoyed their blooms in the spring,” Klaus said. The chestnut foundation may use pollen from the tree in a breeding program aimed at restoring the population with blight-resistant trees. The chestnut foundation has been working for about 15 years to develop a blight-resistant variety. The goal is to infuse the American chestnut with the blight-resistant genes of the Chinese chestnut. American chestnuts once made up about 25 percent of the forests in the eastern United States, with an estimated 4 billion trees from Maine to Mississippi and Florida. The trees helped satisfy demand for roasted chestnuts, and their rot-resistant wood was used to make fence posts, utility poles, barns, homes, furniture and musical instruments. 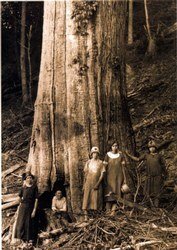 Then these magnificent hardwoods, which could grow to a height of 100 feet and a diameter of 8 feet or more, were almost entirely wiped out by a fast-spreading fungus discovered in 1904. “There are no chestnuts roasting on an open fire, and if they are, they’re Chinese,” Keehn said.